We’re almost at the end of day 3 now. Today we had to wake up at 7 as the contractor, we call him Coen from now on, arrives at 8. Blimey, no celebratory bottles of wine tonight. The room is still spinning and in the night my stomach has not been too gently on me. I don’t get head hangovers but stomach hangovers. In my opinion they are worse as for a headache you can take an painkiller. With a stomach hangover you just feel sick, sick and more sick. You need to drink a lot of water before you go to sleep to prevent dehydration, but apparently I have not drank enough water last night. Dehydration is what causes a hangover. However, I didn’t drink too much water last night so as not having to go the whole route downstairs for a wee. That serves me right. Ah, well. 5 to 8 Coen shows up, 5 minutes too early. I’m still in the middle of dressing. Glad I already had my wash up in the kitchen before I went upstairs, popped my contacts in and strapped my false leg on (not really). The plasterer does show up not too much later. After a big cup of coffee, he gets his instructions from Coen he gets on with his work. Coen himself has not much to do here today so he promises to check up at the end and will also drop in a heater to put in the bathroom to dry the work quicker over the weekend. My, those guys really know how to work. The plasterer has not stopped working but for a quick lunch and back to work. He’s been working almost nonstop for about 5 hours but it’s starting to look like a room again. 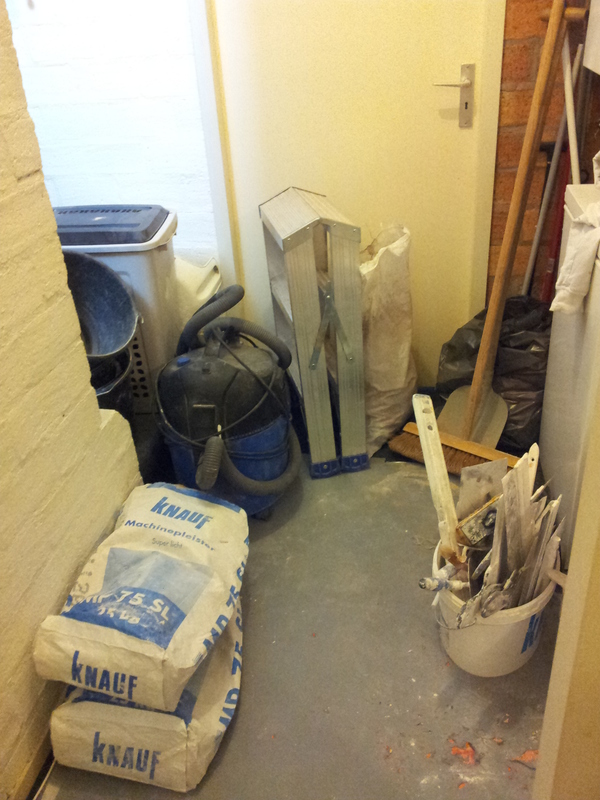 The landing however looks horrific, tools and dust and plaster everywhere. Even going up the attic is no longer possible due to a big pile of buckets tossed aside on the stairs. Somewhere in the afternoon Coen calls to say that the plumber is on his way as he still needs to fit an extension to the soil pipe for the toilet. The one provided with the kit was an old fashioned model/size and didn’t fit on the pipe he put in the floor. He would also drop off the heater so Coen didn’t need to drive 50 km from his place. I can understand that and wished him a nice weekend. He will be available Monday morning at 8. Oh, this means we have to be up at 7 again. We’re no longer cut out for that. Good thing it’s only next week and at the end of that week we might have a working bathroom again. Last night after 6, Coen showed up with the electrician. He didn’t realise the sink unit has extra lights in it and a shaving socket. For that we need extra electric points in the bathroom and this was not what he could do himself. While the electrician did the wiring for the sink unit and lowered the switch for the washing machine, he has been filling the bigger holes in the wall with concrete for it to dry overnight. This made it easier for the plasterer the next day. I have had his crew over the floor now for 3 days and I have to say we are very pleased with the lot. They are nice guys and don’t get upset with me when I pop my head around the corner every time I’m curious to see how they are doing. To be honest this is my sneaky way to watch how it is done, as we are planning for the future to do the downstairs toilet and the more you learn the tricks of the trade, the less you are inclined to make mistakes. On top of that, the downstairs toilet is only a small room and this is something we should be able to do. It will definitely be an interesting project. At this moment we have to house to ourselves again. Justus is staying at his father this weekend as his room is now stacked with tiles, and the new equipment for the bathroom. We’ve had those boxes downstairs in the living for weeks and as the windows and doors need to be all open to get the damp out, the room would not be to comfortable for him over the weekend, so now it is used to store the boxes and we are regaining our living again. 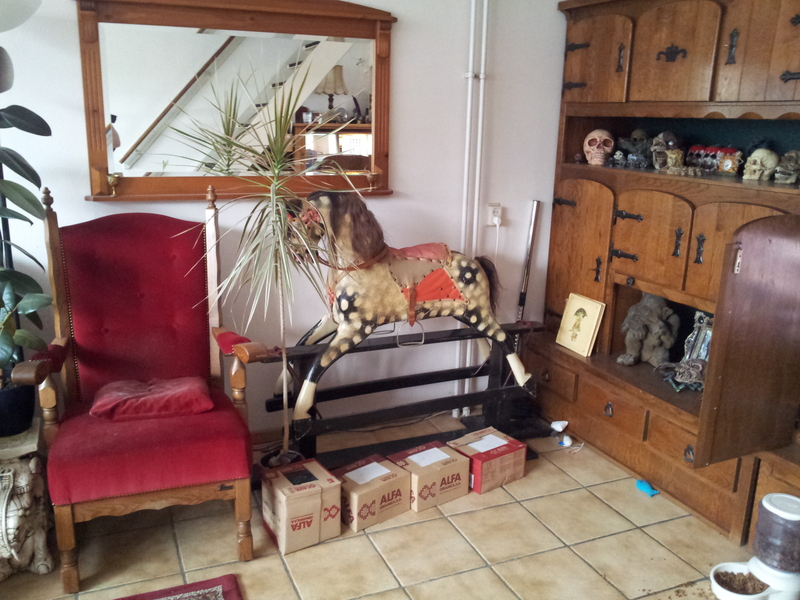 Crikey, I didn’t know anymore we had that rocking horse in the living room, has it always been there? We have noticed a small leakage from upstairs as 2 boxes had damp patches on the bottom. It must have run a bit down the central heating pipes when the plumber was bleeding the radiator upstairs. Luckily is just a small bit and there are no patches showing on the wall itself so no problem there. We we’re planning on doing the shoppings and then make a nice curry but at this moment we are so extremely knackered that we have decided to just have some fries and skip the shopping till tomorrow. If you don’t get any updates over the coming few days, don’t worry. I’m very likely sleeping through the weekend to gather new energy for the next week. I still have to tell you about the plants in the garden, and all the other little things of past week but the bathroom has been on my mind mostly so I will update you on all the other stuff at a later moment. This entry was posted in House DIY, What's happening and tagged bathroom, contractor, home, sick. Bookmark the permalink.